Check out this 2017 Ram 2500 Laramie. Its Automatic transmission and Intercooled Turbo Diesel I-6 6.7 L/408 engine will keep you going. 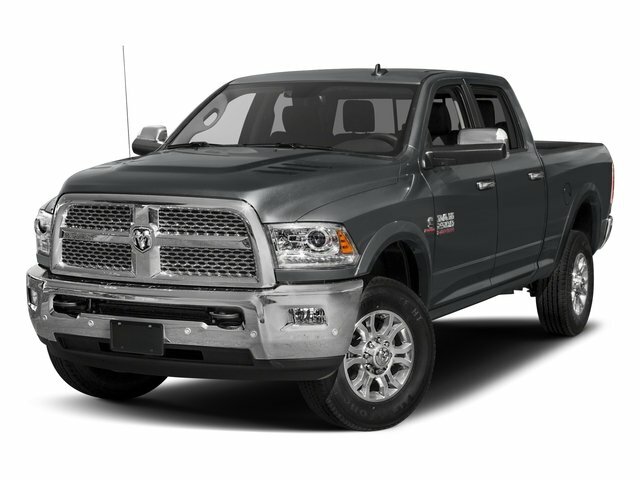 This Ram 2500 has the following options: WHEELS: 20 X 8.0 BLACK PAINTED ALUMINUM, TRANSMISSION: 6-SPEED AUTOMATIC (68RFE) -inc: 3.42 Axle Ratio, Tip Start, TRANSFER CASE SKID PLATE SHIELD, TIRES: LT285/60R20E OWL ON/OFF ROAD, SPORT APPEARANCE GROUP -inc: Body Color Door Handles, Black Ram Head Tailgate Badge, Flat Black 4x4 Badge, Body Color Grille w/Black Wave Insert, Black Power Fold-Away Mirrors, Flat Black Ram 2500 Badge, Painted Front Bumper, Black Wheel Center Hub, Black Painted Exterior Mirrors, Wheels: 20 x 8.0 Black Painted Aluminum, Painted Rear Bumper, Bi-Function Black Projector Headlamp, Tires: LT285/60R20E OWL On/Off Road, Black Premium Tail Lamp, SINGLE DISC REMOTE CD PLAYER, REMOTE START SYSTEM, RADIO: UCONNECT 3C NAV W/8.4 DISPLAY -inc: SiriusXM Travel Link, 5-Year SiriusXM Travel Link Service, 5-Year SiriusXM Traffic Service, 1 Year Trial (Registration Required), Media Hub (2 USB, AUX), HD Radio, For Details Visit DriveUconnect.com, SiriusXM Satellite Radio, GPS Antenna Input, GPS Navigation, Air Conditioning ATC w/Dual Zone Control, Uconnect Access, 8.4 Touchscreen Display, Integrated Voice Command w/Bluetooth, SiriusXM Traffic, QUICK ORDER PACKAGE 2FH LARAMIE -inc: Engine: 6.7L I6 Cummins Turbo Diesel, Transmission: 6-Speed Automatic (68RFE), Front Armrest w/Cupholders, and PROTECTION GROUP. Stop by and visit us at Covert Chevrolet Buick GMC, 702 Hwy 71 West, Bastrop, TX 78602.